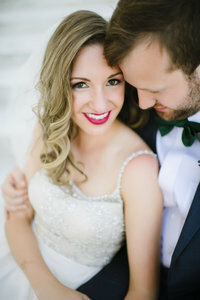 Steele & Blake’s Detroit Opera House Wedding was absolutely hands down incredible! This is such a nice blog because it was unlike any other wedding we’ve documented. The entire theme for their wedding was theatrical. I found out instantly Steele was an absolutely incredible ballerina growing up and it showed. From her pose, to her dancing she was stunningly breathtaking. Steele was very much in the moment for her wedding and the two things that were important to her (Blake and celebrating) showed! Every moment of the day was just jaw dropping. After Steele and Blake finished their prepping they decided to have a first look inside the theatre underneath the blue/gold dome. Steele walked up to Blake and before she could tap his should she said “Marco” and he replied with “Polo” and turned around. It was such a fun way for them to see each other for the first time on their wedding day! The guests arrive and were seated in the theatre for Steele and Blake’s moment. The ceremony began and Steele & Blake married on stage in front of a gorgeous stand with beautiful flowers hanging next to an incredible band playing music. Instantly, and I mean instantly following the service the party started and it started AWESOME. They had an electronic violinist playing during cocktail hour which happened in the lobby area. One really good component to Steele & Blake’s soiree was that the guests had no idea where the reception was going to take place. Not one person knew! Witnessing the guests having a blast and documenting it during the most incredible music I’ve heard during cocktail hour was truly unforgettable. As cocktail came close to an end Phantom of The Opera’s “The Final Countdown” started to play. Everyone continued to celebrate as usual and then it came…..the lights all shut down. Everyone stops, is confused doesn’t know what’s happening. The lights come back on and flicker…. The guests all come back downstairs by the theatre doors and they suddenly open… the guests all walk in feeling confused then suddenly the curtains rise and just after they rise the Simon Vatale band is on stage in the reception room and started to play music! It was SO INCREDIBLE! Everyone was shocked and BLOWN AWAY! Bravo to everyone involved to make that happen it was truly a sight to see! Upon walking on stage to the reception Steele and Blake had their first dance to “Tonight, Tonight by The Smashing Pumpkins” and then the night was history filled with laughter, fun, and a WHOLE LOT OF DANCING! Steel & Blake we were truly blessed to be there to document your day! You love to have a great time and it absolutely shows congratulations to you!